Indian are the most diverse of all inhabitants on this planet. Understanding us is very difficult. But with India growing towards the superpower status, it is crucial as well. Mobile industry is one where we are still under penetrated and has huge potential. This precisely explains why Ericsson has taken the pains of undertaking an in-depth research to understand our issues. In this Transforming Experiences report, telecom infrastructure company Ericsson revealed almost one-in-four urban Indian mobile user has issues like network, mobile Internet, billing and charging with their service operator, but only half of these issues are reported! 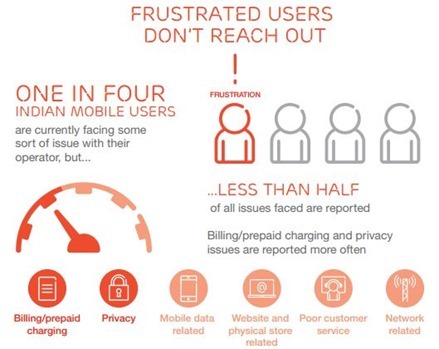 The three most common problems are network, mobile Internet or billing and charging related. Other issues include poor customer service, unsolicited calls or SMS that infringe privacy and bad experiences at the operator’s store or in accessing their website. Methodology: Traditional – Across 16 urban cities over 15-50 years of age group across all socio-economic classes, the study had 95% prepaid respondents as customers with more than 4000 face-to-face interviews and nearly ten focus group discussions in India from Feb-April 2013. Non-traditional – Social media data was also used and Ericsson followed over 250 million tweets and 1.8 million posts across Facebook, Twitter, blogs and complaint forums to identify 100,000 key conversations on mobile broadband experience among Indian online users starting June 2011-Jan 2013. Thus the survey is representative of the views and opinions of nearly 100 million urban mobile Indian consumers. 1.1 Why are all users not reporting? 1.2 Why are users switching operators? 1.3 Is accurate billing crucial? 1.4 Are Customer Care Agents inefficient? 1.5 Are the agents purposefully doing it? 1. Telcos miserably fail in benchmark test – Pampered with good experience from others in the service industry (like retail and ecommerce), 1/3 of existing mobile users feel their experience with the mobile operators is the most frustrating. 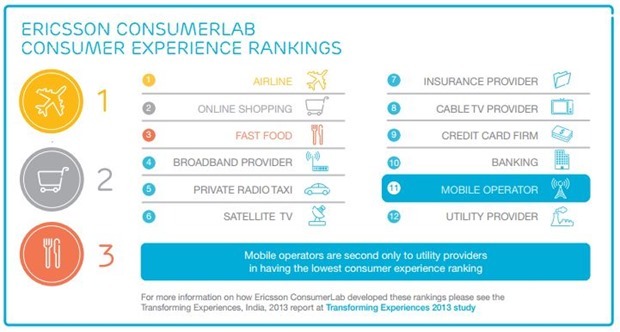 Mobile operators stand a lowly 11th out of the 12 service industries studied. 2. There is huge diversification in what mobile users state is most important to them while dealing with their operators – no single magic pill. ‘Initial purchase process’ and ‘service and support’ are rated as most important touch points. 3. Users complain but not to the operators – One in four urban Indian mobile users is currently facing some sort of issue with their operator but only half of all issues are reported. 4. Users’ expectations are growing in line with the newer types of complex mobile devices and operators are facing a rate of churn that is increasing as users adopt new advanced data services. 5. Even Customer Care Agents are finding the going tough – three in five of them find it difficult to support mobile data users with the tools and information available to them. 6. Retaining profitable users will rely on prioritizing and identifying shifting consumer needs – these include basic needs such as billing, as well as those including network performance and delighters like assured mobile internet speeds, rewards and loyalty programs. Why are all users not reporting? The reason for the lack of complaints is that customers do not want to go through the hassle of contacting the operator. The thought of long periods stuck on hold and then having to go through monotonous troubleshooting puts them off. May be the lengthy IVRS process telcos have adopted fit them just fine. I too am a victim!!! Why are users switching operators? 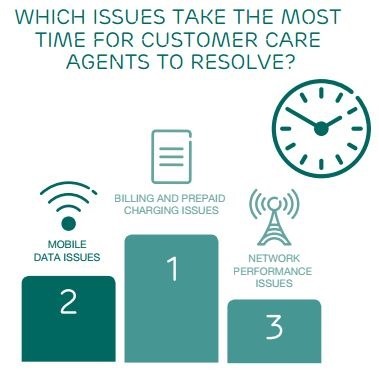 Poor customer support and poor network or mobile internet performance together account for 54 percent of all issues faced by those looking to switch operators. According to data released by TRAI, almost 8.97 crore people want to port out from their existing service provider all across the country and this staggering number of porting requests were received till March. For us every penny counts. 78 percent rate billing and charging accuracy as very important and would like to see a penalty fee imposed if operators overcharge. Quickly resolving billing issues is critical, as many consumers will immediately consider switching provider, even over very small sums of money. Are Customer Care Agents inefficient? Many agents work in high pressure environments in which their performance is judged based on their average call handling time. This is counter-productive to providing a great customer service. Are the agents purposefully doing it? 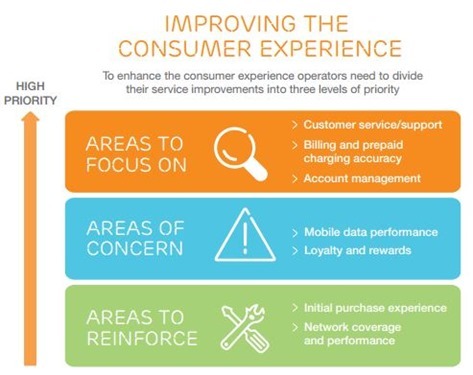 By embracing three key areas – network performance, transparency and control – and by improving customer service and the support experience, operators can exceed expectations. By doing this they transform the consumer experience from one that merely satisfies, to one that genuinely pleases consumers. One drawback of the study: Just 5% respondents were postpaid. Telcos normally treat postpaid subscribers as royalty, thanks to the sure-shot long bills which they generate! Has the third rate treatment meted out by telcos to us got to do anything with India being amongst the countries with the lowest ARPU (Average Revenue Per User) and that they are surviving on wafer-thin margins? What’s your say?